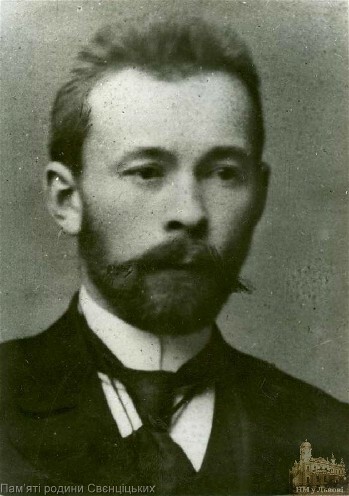 Svientsitsky, Ilarion [Svjencic’kyj] (Sventitsky, Sviatytsky), b 7 April 1876 in Buzk Kamianka-Strumylova county, Galicia, d 18 September 1956 in Lviv. (Photo: Ilarion Svientsitsky.) 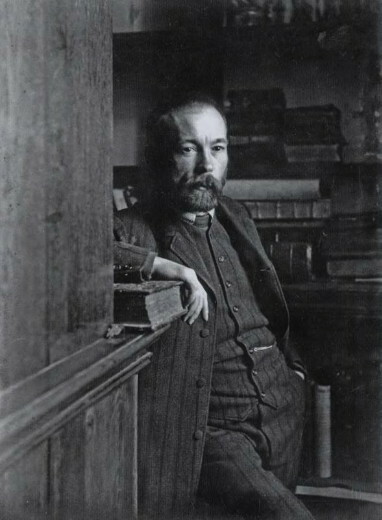 Philologist, paleographer, museologist, art historian, and bibliographer; full member of the Shevchenko Scientific Society from 1914 and the Ukrainian Theological Scholarly Society. He graduated from Lviv University (1899) and studied at the universities of Saint Petersburg (1900) and Vienna (PH D, 1902). He was editor of the Lviv Russophile journal Zhivaia mysl’ (1902–5). He was director of the National Museum in Lviv (1905–39, later the Lviv Museum of Ukrainian Art, 1939–41, 1944–52). He was a docent at Lviv University (1914, 1934–9) and was appointed deputy director of the scholarly section of the Kyiv Municipal Museum. He was a lecturer at Kyiv University (1917–18), a professor at the Lviv (Underground) Ukrainian University (1922–5), and president of the Mohyla Scholarly Lectures Society. In 1927 he took part in the All-Ukrainian Orthographic Conference in Kharkiv. After the Soviet takeover of Western Ukraine he headed the Slavic philology department at Lviv University (1939–41, 1944–50) and the Division of Linguistics at the Institute of Social Sciences of the Academy of Sciences of the Ukrainian SSR in Lviv (1944–50). Svientsitsky studied the language of medieval East and South Slavic literary monuments. He wrote a book of essays on the history of the 11th- to 18th-century Ukrainian language (1920) and articles about the 13th-century Horodyshche Gospel (1912), the testaments of Yaroslav the Wise and Volodymyr Monomakh (1902), the 14th-century Lavryshevo Gospel (1913) and Novi Sad Apostolos (1918), the Galician-Volhynian Chronicle, 14th- and 15th-century Western Ukrainian charters, the treaties of Kyivan Rus’ with Byzantium, the 1229 Smolensk Charter, and Old and Middle Ukrainian literary monuments (1901). He also published two volumes of historical materials about the national revival in 19th-century Transcarpathia (1906, 1909). Among his other works are a short book on Taras Shevchenko in literary criticism and reality (1922); a Ukrainian grammar in Polish (1922) and Russian grammars in Ukrainian (1902) and Polish (1915, 1931); a Ukrainian-Polish/Polish-Ukrainian dictionary (1920); booklets on the rebirth of Belarusian literature (1908, 1914), on the foundations of scholarship concerning the Ukrainian language (1917), on Volodymyr Vynnychenko as a writer (1920), and on Mykhailo Drahomanov and the Galicians (1922; repr 1975); and articles on various subjects. A book of his Polish essays on the history of Bulgarian literature was published posthumously in 1957. As an ethnographer he was particularly interested in funeral laments, and published a long article on the subject in Etnohrafichnyi zbirnyk (1912). Under Svientsitsky's direction the National Museum and its library became major repositories of Ukrainian artifacts and Church Slavonic and Old Ukrainian books and manuscripts, and centers of scholarly research. He published an illustrated guide to the museum in 1913. He prepared important descriptions of the manuscript holdings in the library of the People's Home in Lviv (1904–5) and its Antin Petrushevych collection (3 vols, 1906–11), the 12th- to 15th-century Cyrillic manuscript holdings at the National Museum (1933), and the manuscripts at the Stauropegion Institute (1908), and a catalog of Church Slavonic printed books (1908). As an art historian he produced books on the ornamentation of 16th-century Galician Ukrainian manuscripts (3 fasc, 1922–3), the beginnings of printing in Ukraine (1924), church painting in 15th-and 16th-century Galicia (1914), and the development of Ukrainian art in Western Ukraine (1944). His book on 15th- and 16th-century Galician icons (1929) remains an important illustrated source on the subject. Svientsitsky was also an enthusiastic amateur of modern Ukrainian art, and in 1931 he established a gallery for such art at the National Museum. A bibliography of Svientsitsky's works, compiled by O. Kizlyk and R. Lutsyk, was published in Lviv in 1956.